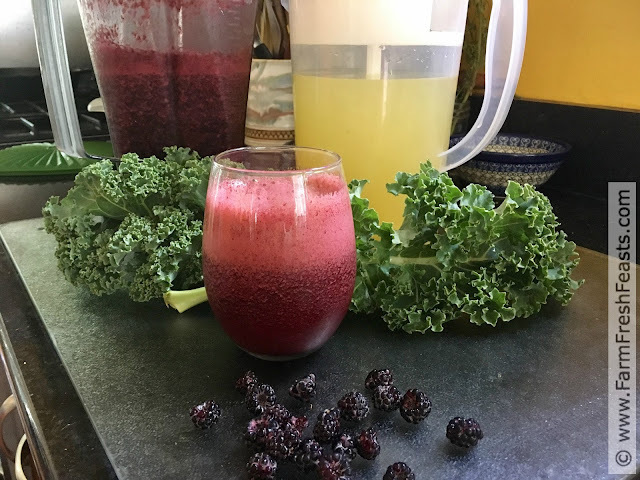 A refreshingly icy raspberry lemonade boosted with kale and pomegranate juice. This is a great way to get your greens in--after blending, the color of kale disappears into the drink. You might even say it's magic. Magically delicious, that is. My happiness upon seeing kale in the Community Supported Agriculture (CSA) farm share box is not feigned. I like kale--curly kale, lacinato kale, Red Russian kale . . . it doesn't seem to matter which variety. I like them all. This transformation from dreading kale to anticipating kale came in part because of my Vitamix. Let's clear one thing up right now--I bought my Vitamix around 2001-02 and started this website a decade later, so there is no relationship to disclose when I mention the brand name of the machine. I'm just sharing what gives me excellent results every time. Just not with pizza dough--too difficult to get all of the dough out of the machine. 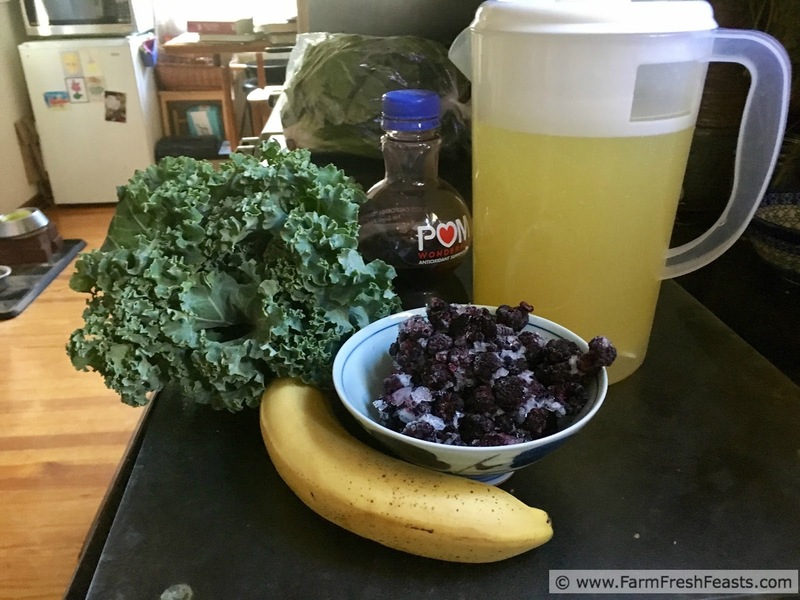 Using my Vitamix to turn kale into a beverage revolutionized the way I see kale. Because kale is a cool season crop, it arrives in the farm share box along with many other greens. I'm more interested in cooking the cabbage, the chard, my beloved beet greens, or spinach. I'd rather make a salad with the lettuces that are invariably included in the same box as kale. 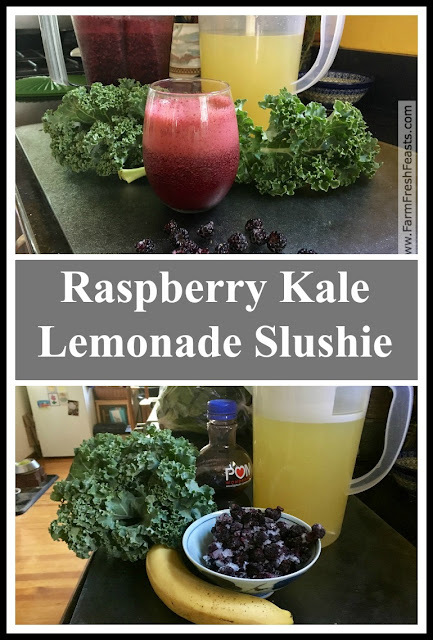 This leaves kale the odd green out, but this refreshing recipe turns kale into a summer sipper the whole family enjoys. There's a video in this post. It's not because I don't think you can throw a few ingredients in a blender and flip the switch without a tutorial. Nope, this video is just for me, for practice. I've been hired by the Ohio Pork Council to make some recipe videos later this year, and I want to figure out what I'm doing before I REALLY need to deliver. So, this is my freshman effort, then. * What do you think? Click the video to watch how to make the smoothie! * The military moved my spouse to Minnesota, so I'm practicing How To Talk Minnesotan. You bet! For more recipes using kale, please see my Kale Recipes Collection. For more recipes using raspberries, please see my Raspberry Recipes Collection. They are part of the Visual Recipe Index by Ingredient, a resource for folks like me eating from the farm share, the farmer's market, the garden, the neighbor's garden, and great deals on ugly produce at the grocery store. A refreshingly icy raspberry lemonade boosted with kale and pomegranate juice. This is a great way to get your greens in--after blending, the color of kale disappears into the drink. Place all ingredients in a powerful blender (I use my Vitamix) in the order listed. Begin at a low speed until the kale is in small pieces, then gradually increase speed until smooth. Serve and enjoy! This slushie will settle out a bit. If you're storing it in the fridge for a while, just give it a shake before drinking. I think your first attempt at doing a video is a solid one. I'm impressed with that and your new found accent. It could be a good look for you. Also hooray kale. I like to drink mine or make potato kale soup. Once I'm done with the immersion blender, you can't even tell it's there.